For children and adults alike, Easter is often a time for indulging in chocolate without feeling too guilty. After all what’s Easter without Easter eggs? But dog owners, beware! Don’t be tempted to share your creme egg with your pet, no matter how mournful they look. Cocoa contains the compound theobromine, which is highly toxic to dogs. Most dog owners take care to keep chocolate out of reach. But at Easter it can be hard to keep track of the sweet stuff, especially if there are children involved. It’s not unusual for kids to start munching on one Easter egg, only to be distracted by another. So chocolate can end up in the most unexpected places. And we all know how good dogs are at sniffing out items of interest! If you think your dog has eaten chocolate, it’s advisable to contact a vet as soon as possible. Small amounts of theobromine might have a negligible effect but it’s very difficult to know how much your dog has actually ingested – levels of cocoa in various brands differ. How Do I Know If My Dog Has Eaten Chocolate? The signs that a dog has ingested chocolate vary depending on the amount they’ve eaten. The most common tell-tale symptom is diarrhoea. Some dogs show other signs like panting, increased heartbeat and increased urination. The amount of chocolate harmful to a dog averages between 100 and 200 mg. It can be difficult to pinpoint an exact amount as there are several different factors to consider. For example, baking chocolate could potentially contain 70 percent more theobromine than regular chocolate. So a smaller amount of baking chocolate could be just as risky as a larger piece of regular chocolate. Theobromine poisoning can be fatal so don’t delay if you suspect your dog has eaten even a small amount of chocolate. Take them straight to a vet. 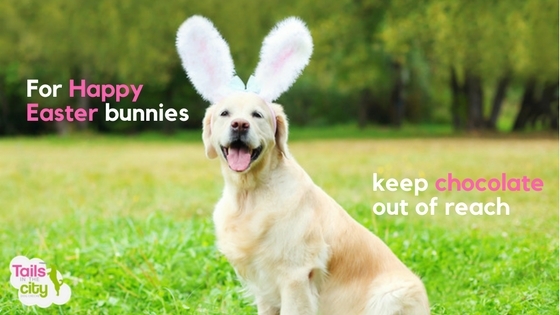 How Do I Treat My Dog at Easter? For those of us who want to treat our faithful friend to something more than doggy chocolate drops at Easter, there are now a range of Easter eggs on the market designed with our pets in mind. They completely omit the use of cocoa so there’s no danger of theobromine poisoning. They’re instead often made from carob, a popular, tasty and safe cocoa substitute. So like the rest of the family, your dog can wake up on Easter morning to their very own chocolate egg without any risk to their health.